– but the body joins with the natural world, howling in revolt, pain and fear. The body is that of Bolatta Silis-Høegh, the nature that of her homeland, Greenland. Last October, the Greenlandic self-rule government voted to abolish its no-tolerance ban on uranium extraction, without consulting the Greenlandic people and ignoring calls to properly inform the population of the risks posed by uranium mining. This was the spark that inspired Bolatta’s rage, embodied in blood and scars, her naked flesh conveying both vulnerability and the raw source of these emotions. 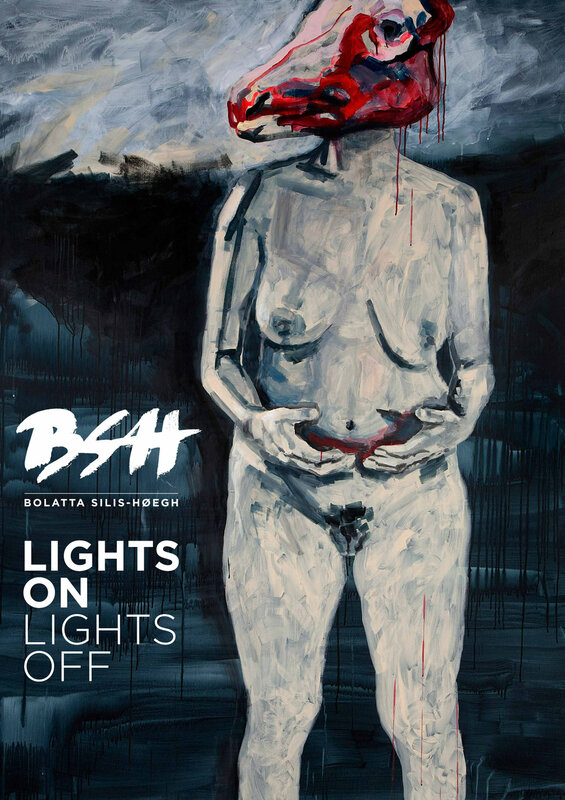 From this source Bolatta turned to painting in an act of expressive necessity, and what results is a series unlike anything she has produced before. Her past projects’ playful blending of history and mass culture, of cityscape and small town imagery, or her irony toying with the serious message of climate change in Sisimiut 2068, are gone. The dark, bare landscapes that threateningly emerge and the artist’s bloody, naked body mark a new direction in her work toward an inner world where emotion cannot be contained. The anger that sparked Bolatta’s need to paint stirred other anxieties creeping beneath the surface. Perhaps, then, the landscape is not that of the now-threatened Greenland, but a deep, inner landscape with a hidden ecology of emotion, coming to the surface in the form of blood and violently dripping paint, hinting at what Bataille called ”base materialism,” raw matter that threatens traditional material order and has the potential to free one from the rigid, unnatural structuring of human subjectivity. The darkness does not overwhelm the artist or the viewer, but lets them openly engage with their fear, anger and pain. Set into the crumbling decadence of Kongelejligheden, these feelings can truly be tapped into, and the threat of environmental destruction can be encountered on bodily and emotional levels. Throughout the North there is an urgent need to address these issues openly, as painful as they may be. Norway has recently announced plans to begin oil exploration in the precarious high arctic. Mining is literally tearing apart Swedish towns as well as Saami reindeer territories and ancestral homelands. The same threats are appearing in the heart of Finnish Sápmi and the pristine Kevo Strict Nature Reserve, where the state has approved a permit for diamond exploration. Lights On, Lights Off calls for an open encounter with the pain and anger evoked by these threats, as well as the internal pain we all harbor. When we close our eyes to our own anger and fear, those emotions wreak havoc on us. By opening our eyes, we can access their power to resolve them and lift ourselves up.